This week I received an email from a mom of a nine-year-old swimmer who wanted to know how to help her child after she missed the cut for a big meet. This is something I know all too well. I talked today to my daughter and son about it and they definitely remembered those days, too. My son said, ” That was my life!” Here’s a link to the SwimSwam.com article “Ask Swim Mom” I wrote. It also reminded me of this post I wrote five years ago! One of the most important things they learned is perseverance. That stick-with-it never give up attitude that is ingrained in their brains after years of trying for swim goals and just missing them. Then trying and trying again and again until they make them. The very nature of swimming 50 weeks a year, six days a week, makes kids tough. I’ll never forget my daughter’s frustration of missing her junior national cut by fractions of a second for two years. She didn’t give up. She worked hard. She would still miss. “Are you kidding me!” She said looking at the scoreboard to see her missing the coveted junior national cut by mere tenths of a second after dropping three full seconds on an 800 meter freestyle race. The next race, she said, “I’m so done with this!” She dove in with more determination than ever, and yes, she made her cut, dropping seconds on her 200 meter free and coming in second place to one of the fastest girls in the country. My son also swam. He worked so hard for every goal, trying to qualify for meets through ten years of year-round swimming. I’ll never forget his determination as an 8th grader. I was a chaperone for his Washington DC trip with his class. He knew he’d be missing too much swimming, so he would run up and down through the Mall, up and down the steps to the Lincoln Memorial, while everyone else strolled. At night in the hotel, he ran the gray cement staircases, up and down the five flights. When he returned to the pool, he did it! He made his first Junior Olympic time. Now he’s in college and he knows how to persevere. He wanted to work at the campus radio station. He put in his application as a freshman and was declined. As a junior he has been assigned a time slot on the FM station, moving up from his prior show on the AM. He wanted to be in the College of Creative Studies, “a graduate school for undergraduates.” He applied and was devastated when he was declined. I told him to move on, it was okay, get a ‘normal’ degree. But, he didn’t give up. The next year he applied again and was accepted. Learn more about the UCSB CCS program here. Just click. I’ve had friends ask why my kids spend so much time in the pool, aren’t they missing out? I beg to differ. Spending most of their lives in the water has served them well. Being mostly wet has given them skills for life. Find a local swim club here on the USA Swimming website. 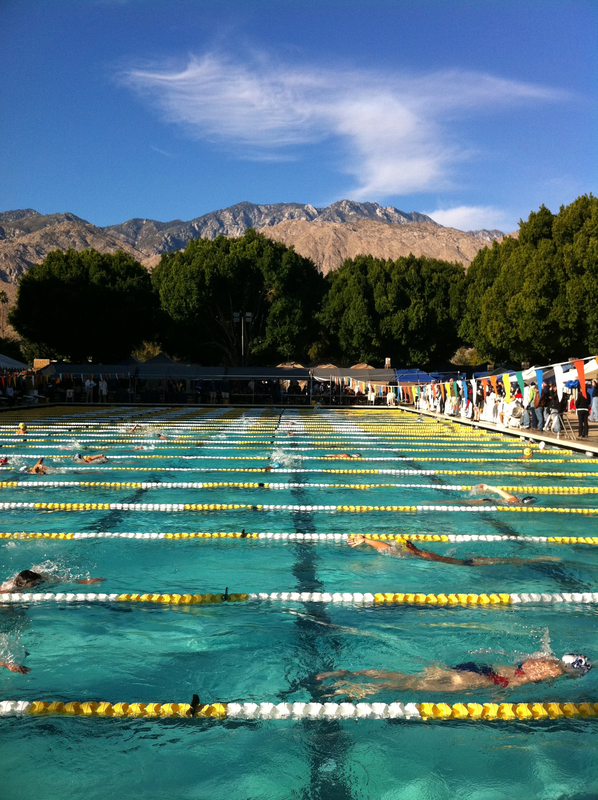 Photo credits: The Palm Springs, CA Pool — one of the most beautiful views while swimming ever. 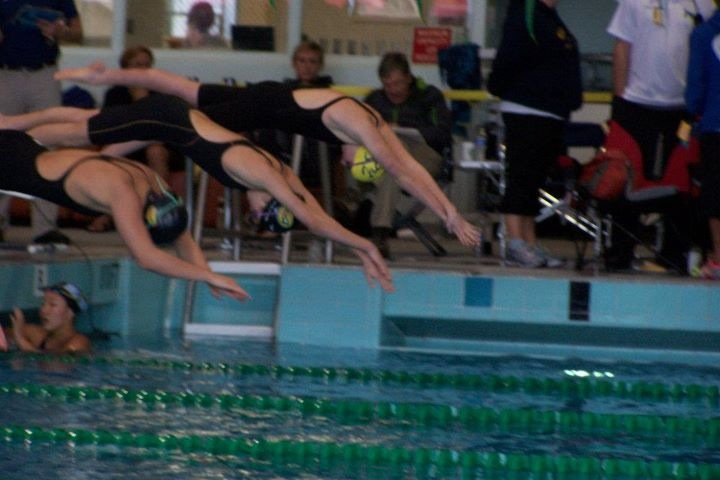 My daughter diving wearing the yellow cap. 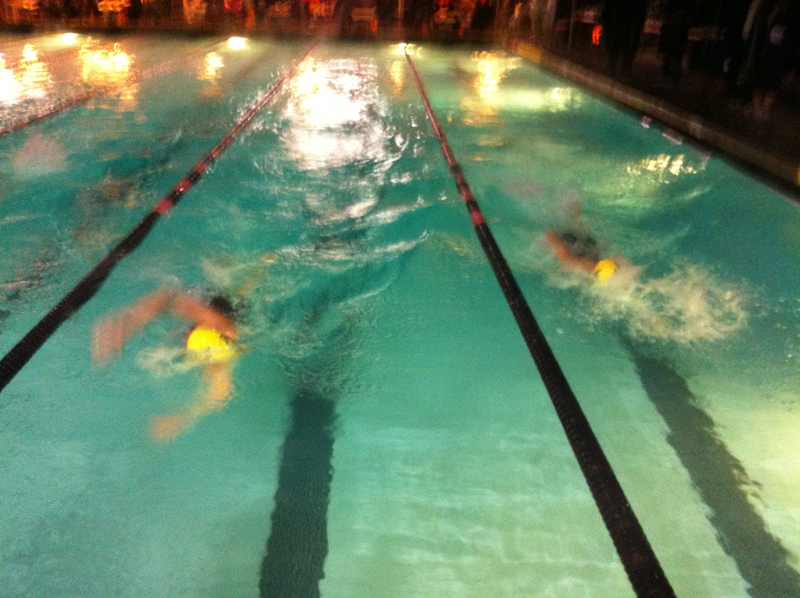 Yellow-capped swimmers sometime at some club meet. 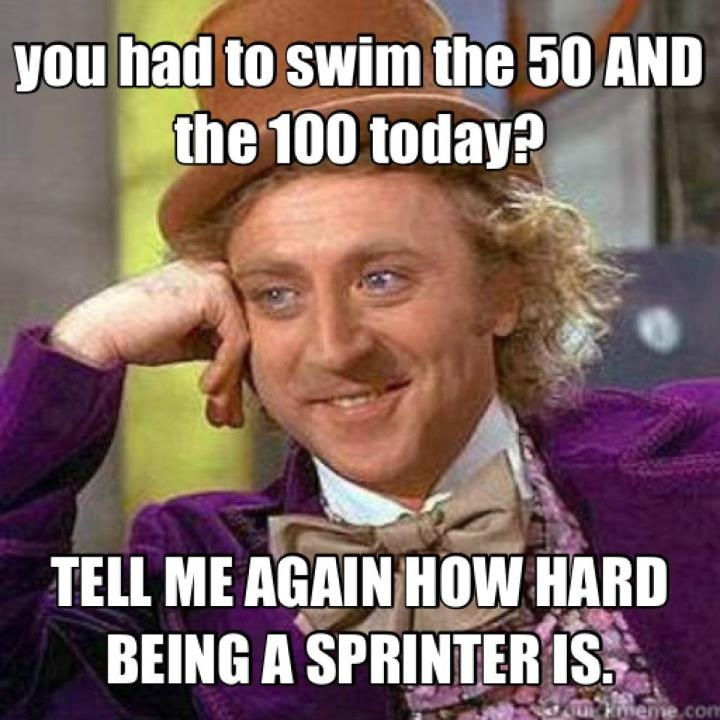 And a great meme for a distance swimmer.